Turn the speaker on by pressing the power button on the top of the speaker. The power indicator will glow white, the Bluetooth connect button (above the power button) will blink white rapidly, and you will hear a tone indicating the speaker is ready to pair. On your Bluetooth device, go to the Bluetooth menu and scan for devices (make sure Bluetooth is enabled). 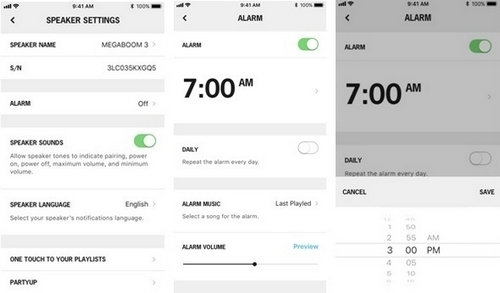 Select BOOM 3 or MEGABOOM 3 from the list of devices. Once paired and connected, you’ll hear an audible confirmation from the speaker. This means your BOOM 3 or MEGABOOM 3 is ready to use. You can pair additional devices with your speaker, see Connecting your speaker to additional devices. Hold down the Bluetooth button until you hear a tone. NOTE: The Bluetooth connection button will blink rapidly, indicating that the speaker is ready for pairing. Select the name of your speaker from the list of devices. On your device, go to the Bluetooth menu and select the name of your speaker from the list of devices. Once reconnected, you’ll hear an audible confirmation from the speaker. Your speaker is now ready to use with the device you selected. PartyUp allows you to connect multiple speakers together. To join the party, you’ll need to get the BOOM & MEGABOOM by Ultimate Ears App and latest firmware for your speakers first. Check the iOS App Store or Android Play Store for the latest app update. Once you have the latest app, you can update your speaker firmware through the app via OTA (over-the-air). Please ensure that all the speakers that you would like to join the party are up-to-date with the latest firmware. NOTE: If the guest speaker is not set as a public speaker, you will see a message with an extra step before that guest speaker can join the party. The owner of that speaker will need to press the Bluetooth button twice on their speaker. What speakers can group with my speakers? To join the party, you’ll need to get the latest and greatest App and firmware for your speakers first. Check the iOS App Store or Android Play Store for the latest app update. Once you have the latest app, you can update your speaker software through the app via OTA (over-the-air). Please ensure that all the speakers that you would like to join the party are up-to-date with the latest firmware. No, BOOM 3 and MEGABOOM 3 don’t support NFC pairing. Play (Resume): Single-press the Magic Button to resume music that you paused. Play (first playlist): Long press — hold for 3 seconds — the Magic Button to start playing the first playlist you selected. Skip (to next playlist): Long press — hold for 3 seconds — the Magic Button to play the next playlist you selected. If the last playlist is playing, then the first playlist you selected will begin to play when you long press the Magic Button. Pause/Play/Skip song in any of your playlist is the same as described above. Make sure your device is paired with your speaker and Bluetooth is active. Turn your speaker off, and then back on again. NOTE: If this is the first time you’re pairing a device with your speaker, you don’t need to press the Bluetooth connection button. It comes out of the box ready to pair. Move the audio source closer — it might be out of the range of your speaker. Move away from other sources of wireless signal (microwave, routers, cordless phones, etc.) — you could be experiencing interference. Re-pair your device with your speaker. Connect your speaker to your speaker to your smartphone, tablet, or any other device using Bluetooth. For help, see Connecting your speaker to your device. Download the BOOM & MEGABOOM APP from the Google Play store or the App Store. Once the app is installed, open your app. When the app is open, the first screen you will see is the screen with your speaker name, speaker image, the features available for your speaker, and access to speaker settings. You are now ready to use the app to take advantage of all the features of your speaker. On the first screen of the app (see step 3 above), you will see an action at the bottom to Get Started with One Touch To Your Playlist. The setup will allow you to choose playlists to directly access from the Magic Button of your speaker. Read the tutorial and follow the on-screen instructions to select your playlist from Apple Music (iOS only) or Deezer premium (Android Only). There is no limit to the number of playlists you can select. Once setup is complete, you are now ready to access your selected playlists from the Magic Button of your speaker. NOTE: To access your playlist from the Magic Button of your speaker, please make sure that you've successfully completed setup of your playlists and that the app remains running and has access to the internet. One App: Use one app to access speaker features for all BOOM and MEGABOOM speakers. Works with BOOM, BOOM 2, BOOM 3, MEGABOOM and MEGABOOM 3. One Touch To Your Playlists: BOOM 3 and MEGABOOM 3 only. Follow the on-screen instructions to select your playlist from Apple Music (iOS only) or Deezer premium (Android Only). Remote On/Off: You’d never walk all the way to your TV to turn it on and you shouldn’t have to with your wireless speaker either. Use the app to turn your speaker on/off from afar. Alarms: Don’t be late again. Choose your favorite music to wake up to. PartyUp: Pair up to 150 speakers for the ultimate sound experience. You can pair any BOOM or MEGABOOM together. To pair your speakers together, every speaker must be updated with the latest speaker Firmware (check the app to ensure your speaker has the latest firmware). Block Party: DJ with friends using Block Party. You and up to 2 of your friends can join the Block Party. Speaker updates: When new software is available for your speaker, a simple tap in the app updates your speaker with the latest features in no time. Your speaker keeps getting better with the in-app updates. Much more: Personalize your speaker’s name and customize EQ preferences. For BOOM 3 and MEGABOOM 3 preset Magic Button playlists. The new BOOM & MEGABOOM app by Ultimate Ears has everything you need to get the most out of your Ultimate Ears speaker. From #PartyUp to customizable EQ, unlock even more awesome ways to use your BOOM and MEGABOOM speakers. Tap on the PartyUp icon on the tab bar to get your party started. Level up the party by connecting as many Ultimate Ears speakers as you can handle! You'll find your available speakers in the drawer - simply drag & drop onto the screen and get ready to turn up. Touch each speaker to see its name and make sure it's the right one. When someone's ready to go, you can drag their speaker back to the drawer and it's instantly out of your party and ready for something else. Or you can go old school and just turn the speaker off. It's up to you. Pro Tip: You can Party Up with: BOOM, BOOM 2, BOOM 3, MEGABOOM and MEGABOOM 3. Just make sure each speaker is updated to the latest and greatest firmware, otherwise, they won't be able to join the party and, really, no one wants to be left out. EQ: You Control the Sound: Want to bump up the bass for your next party? Customize your audio settings in the app. You control the atmosphere with the recommended presets or customize the EQ to your listening preferences. Block Party: DJ with multiple (up to 3) friends using Block Party. Block Party lets you and your friends all play music through ULTIMATE EARS BOOM 2, BOOM 3, MEGABOOM, or MEGABOOM 3 speakers. Anyone that has joined Block Party can now hit play on their mobile device and their music will begin playing through the speaker. To start a Block Party, tap the + sign in the app. Once the Block Party has started, tell your friends to find your speaker in their mobile device’s Bluetooth settings. You and up to 2 of your friends can join the Block Party. If you want to add a new friend, simply kick out one of your current friends from the party by tapping the “X” next to their device’s name, and then a new friend can join. LONG PRESS TO LAUNCH PLAYLISTS Press and hold for 3 seconds. Your speaker will play the playlists you set. TAP ONCE TO PAUSE / PLAY When music is streaming on the speaker, tap once to pause/play the music. DOUBLE TAP TO SKIP When music is streaming on the speaker, tap twice on the button to skip the song. LONG PRESS AGAIN TO SKIP PLAYLISTS Long press again to skip the current playlist. Alarm: Don’t miss an important appointment. You can set your alarm to go off daily or just once and play the music you choose. We removed the old MEGABOOM app from the App Store and Google Play Store. With the new BOOM & MEGABOOM app, you can control all of your Ultimate Ears BOOM, BOOM 2, BOOM 3, MEGABOOM, and MEGABOOM 3 speakers from one app now. BOOM app: If you have auto updates set on your phone, you should automatically receive the newly updated app. If not, please go to the BOOM & MEGABOOM app in the App Store (iOS) or Google Play Store (Android) and update your app. MEGABOOM app: You will be prompted to download and install the new app. Once you have installed the new app, you will no longer be able to use the MEGABOOM app. NOTE: BOOM (1st generation) users must update the speaker to the latest firmware using our Mac and PC update tool, in order to use the new app. Exit pairing mode by either pairing to a source device or by long pressing (holding for 3 seconds) the Bluetooth button on the speaker. After exiting pairing mode, your speaker should appear as an available speaker on the PartyUp screen. There are two ways to charge your speaker. 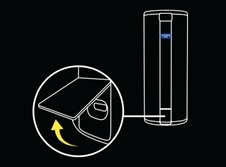 Open the sealed weather door on the back of your speaker to locate the micro USB port. Plug a power adapter to the wall, connect the USB cable into the power adapter, then connect the micro USB connector to the speaker. A white LED next to the micro USB charging port will illuminate and pulse while the speaker is charging. Once it is fully charged, the LED will be solid white. Connect your Power Up charging dock to a wall outlet using the included USB cable and a power adapter. Place the speaker on the charging dock. Make sure you see the LED blinking to indicate that the speaker is properly charging. When the speaker is fully charged, the LED will stop blinking and stay ON. Be sure that the micro-USB port and the charging ring at the bottom of the speaker are both clean and dry before charging. Can I use third-party charging adapters and cables to charge my speaker? Yes. You can use third-party charging adapters and cables to charge your speaker. However, the charge time might vary depending on the power rating of the charging adapter. If you continue to have issues charging your speaker, please contact Customer Service. Do I need to clean my speaker after using it in or around water? 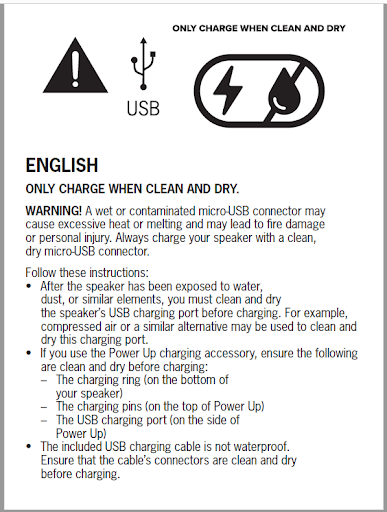 Always thoroughly rinse and dry your speaker, micro-USB port and charging ring with fresh water after using it in a swimming pool or the ocean. While the speaker is waterproof, the chemicals and salt in your pool or the ocean can damage the waterproof seals over time if not rinsed off after use. Your speaker is rated IP67. This means it can survive immersion in 1 meter or 3.3 feet for up to 30 minutes. Yes. BOOM 3 and MEGABOOM 3 float in water and are completely waterproof. Can I use my speaker to make phone calls? No, BOOM 3 and MEGABOOM 3 don’t support voice calls. Does my speaker have a voice assistant feature? No, BOOM 3 and MEGABOOM 3 don’t have a voice assistant feature. No, BOOM 3 and MEGABOOM 3 don’t have auxiliary ports. Do BOOM 3 and MEGABOOM 3 support HFP and Speakerphone? The new BOOM 3 and MEGABOOM 3 do not support Bluetooth HFP, so speakerphone functionality is unavailable for these products. Older BOOM products will continue to work with Siri and Google Voice. How do I update the software on my ULTIMATE EARS BOOM 3? While it is quickest and easiest to update over-the-air with the app for your ULTIMATE EARS speaker, if you can’t update using the app or you simply prefer to use an old-school desktop updater, we’ve still got you covered. Click on the Mac or Windows download link below to download the update utility. After you download the app, run it and follow the on-screen instructions. You’ll need to connect your ULTIMATE EARS BOOM 3 to your computer to complete the update.